It is surprising to me in the volatile world of college hockey that a two week layoff finds no change at the top spot in the major polls. Certainly some team that is shinier and just of a crushing upset would have bumped the Bulldogs, but here we are. So what is the take away? UMD is just that good or there isn't a dominant team out there to take the spot? It has been a year of spread out losses for the top teams and usual upper echelon teams maybe struggling a bit. So take Penn State, the team with the least losses in the country in D-1. One loss, but lack of competition is likely the reason for PSU staying #3 or lower in polls. 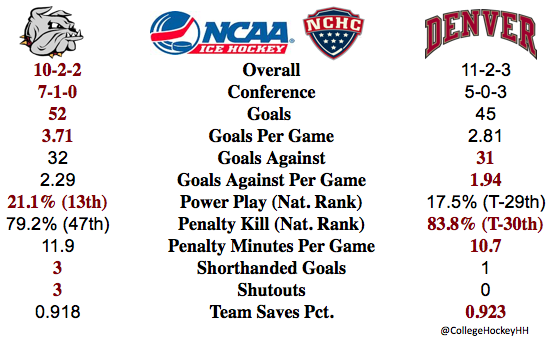 They did go 1-0-1 against Notre Dame, but that was they're only quality opponent with the lone loss to St. Lawrence. So here we are again, NCHC teams meeting as #1 and #2. It should be a quality series. That is if UMD can get back up to speed right away. That "knocking the rust off" stuff has to stay off minds and mouths around the Bulldogs. Self fulfilling prophesy... Top teams don't need or use that and it is what should be expected from this year's Bulldogs.